This month we followed a different format. Instead of being paired up with two people (one who bought and sent to me and the other I bought for and then sent the box), we were paired with one other person. We bought and sent to each other. This month, I was paired with Jessica who lives in Mississippi. She had never been to Ohio and I have never been to Mississippi. I sent her a box of my usual goodies, One of which is the Triple Treat Granola. All 3 times that I’ve sent that granola, the recipient loved it. Thank you Jessica for the great box! I’m so proud of myself. Today we were given a chance to go apple picking at one of our fellow church member’s houses. We could take as much as we wanted which is totally cool. The Imaginative One is a fussy eater but loves his apples and applesauce. So I jumped at the chance. We picked a lot of apples and made memories with the boys. The Imaginative One ended up getting stung by a bee but was happy because the apples were absolutely delicious. That made up for his finger being stung. Once we got home, I washed some of the less attractive ones. Then I peeled and cut them into smaller pieces. I placed into one of my bigger pots, covered the apples with water, and cooked them for half and hour. The boys then helped me puree the apples in the blender for a smoother applesauce. 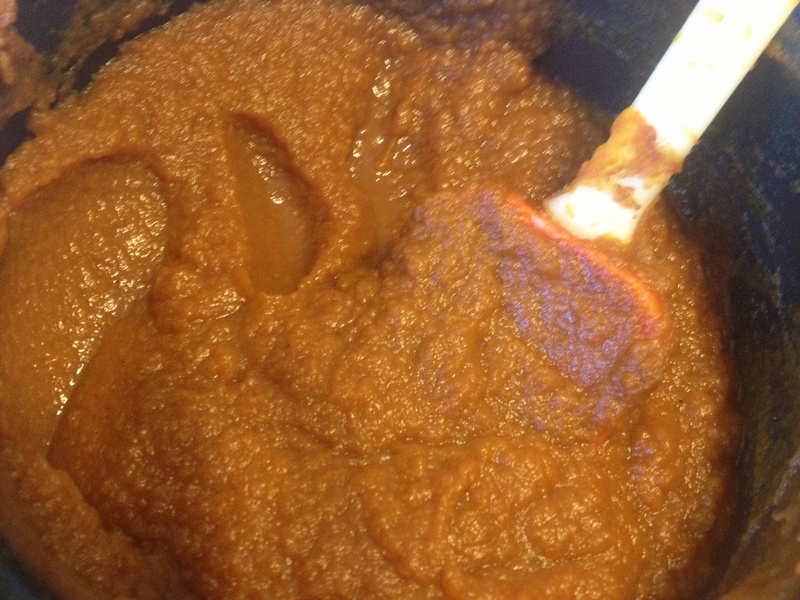 The end result was a delicious applesauce. So why am I proud of myself. 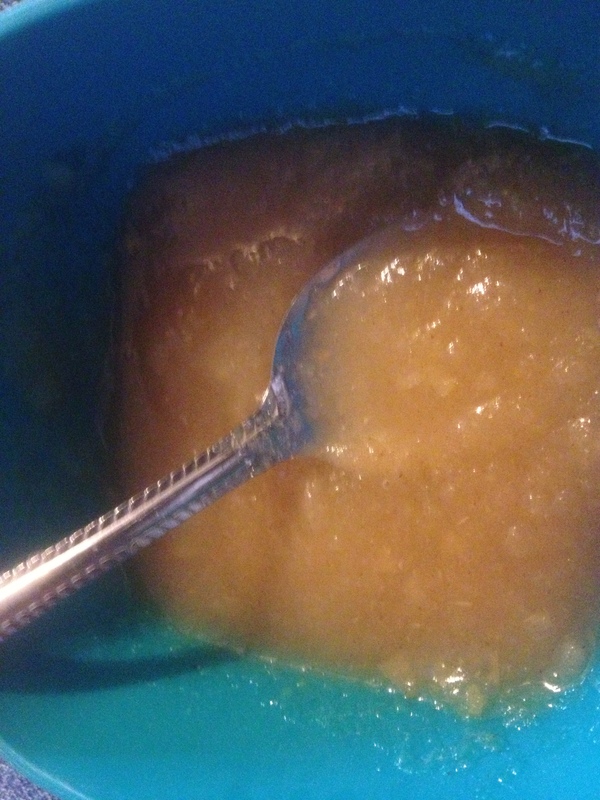 I made homemade applesauce that I know the boys will eat. I made memories with the boys. We picked the apples and within 2.5 hours I had applesauce. That is why I’m proud of myself. Wash, peel, and cut apples. Place in a big pot and then cover with water. Sprinkle with cinnamon or put in the cinnamon sticks. Put the pot on the stove and turn the heat on to high. Allow the water to boil and then turn to medium low. Place in a bowl. Sprinkle with more cinnamon and sugar to taste. Enjoy warm or cooled down. The Imaginative One hates zucchini so much when I asked him to pick one up at the local farmer’s market, he refused to even touch. He also refused to taste this cake because he had a feeling I put zucchini in it. He forgot there was a possibility later on in the week and ended up trying it. He still didn’t like. Don’t let his dislike of the cake and zucchini discourage you from trying this delicious cake. He is such a fussy eater. I really enjoyed this cake. In fact I took pieces of it as a lunchtime treat. It is so yummy! In a separate bowl, combine the dry ingredients and mix well. Add the eggs and sour milk or buttermilk to the sugar applesauce mixture. Then gradually add the dry ingredients to the wet ones. Stir to combine. Add the zucchini. And then stir it until incorporated. 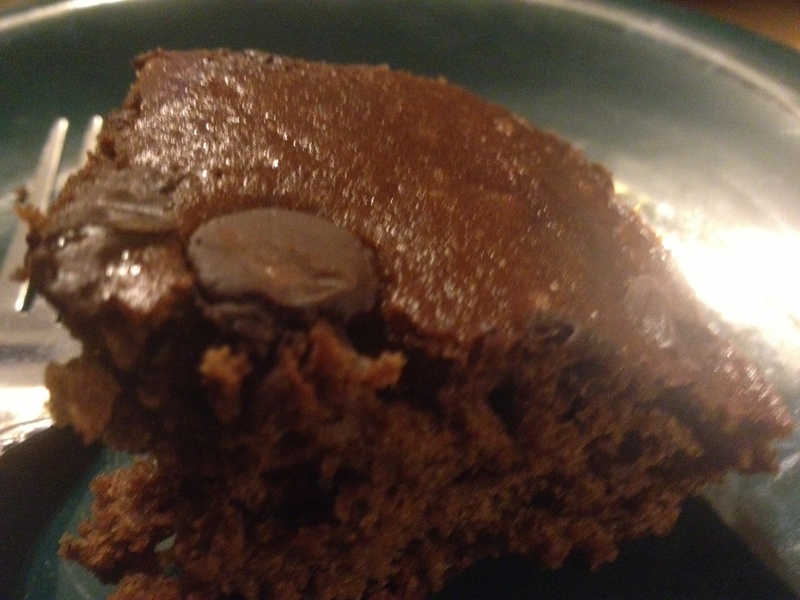 Pour into a greased 9 by 13 pan and then sprinkle the chocolate chips over the top of the cake. Bake at 325 degrees for 40 to 45 minutes. We love to eat different jams, jellies, and even fruit butters around here. It’s usually just Hubby and I that do that. Sometimes the Wee One will also try a new flavor of jelly. The Imaginative One loves only grape jelly and don’t you dare try to get him to eat something different. He’s not adventurous with his eating. I had bookmarked this recipe last year and refound it today. Since I was going to the grocery store, I got all the ingredients and and made a batch. Yum! And easy!!! Combine the ingredients in a med. to lrg. size saucepan. Stir well. Turn the heat onto high and bring the mixture to boil. Turn the heat to medium low and let it cook down for 30 to 45 minutes. Stirring frequently. If needed, add more spices. I froze 1/2 of the pumpkin butter and the other I put in the fridge to eat on my fav. ciabatta bread. A few weeks ago, I posted about 6 easy breakfasts. One of the breakfasts, I talked about was fruit and yogurt parfaits. It is so simple and quick to prepare. Plus it’s delicious to eat and the flavors can be changed up depending on your mood. In a bowl or Mason jar put the yogurt in the jar or bowl. Place the fruit on top of the yogurt. if you are not eating the parfait right away, pack the granola and put it on top of the yogurt and fruit right before you eat. If you are going to eat it right away, top with granola. It’s a few days late but better late than never. My two love French toast cooked by Moi instead of from the freezer section. The Imaginative One gets a headache with store bought French toast/sticks. French toast is simple to make and you can try a variety of different breads. I usually use sandwich bread or if I want to make sticks I’ll use Texas toast bread because it’s thicker. When I made it on Saturday, I used ciabatta bread for Hubby, Imaginative One, and myself. I used sandwich bread for the Wee One because he likes me to cut them into strips. BTW: Did you know ciabatta is Italian for slipper? Warm up a flat griddle pan (my favorite) or skillet over med. heat. In a flat wide pan, whisk together egg, milk, cinnamon, and vanilla extract. spray your griddle pan or skillet with cooking spray. Transfer it to skillet or griddle pan. Enjoy with whatever toppings you like! Before we left, the boys and I walked out to the beach. The Wee One was crying because he did not want to leave the ocean. The Imaginative One was looking for sea life while we were down there. Finally we got on the road and traveled to Georgia. At one of the rest stops, I got a drink out of the vending machine but didn’t have enough on me to get the boys anything. (It was in the car.) A gentleman approached me with 2 dollars for the boys. The Wee One used his dollar to get what he had his eye on. The Imaginative One kept his money. When we were almost to our destination, we got into a traffic jam. There had been an accident. Luckily we only to travel on I-75 for about a mile so we got out of it pretty quickly. We’ve driven through Atlanta on the highway but never on the surface streets so it was neat to see a different side of Atlanta. Once we got the hotel, we checked in and then walked through Centennial / Olympic Park to get to the Aquarium. The line to get into the Aquarium was long even though we already had tickets. Once we got to the front of the line, we realized it was because we needed to go through the metal detectors. We loved the Aquarium! Our favorite exhibits were the 3D show, the whale sharks, the beluga whale, the frog exhibit, and the dolphin show. When we were done with the Aquarium, we once again walked through Centennial / Olympic Park but took extra time to enjoy our surroundings. The funniest thing was seeing a man walking 6 dogs. All 7 of them were wearing sunglasses. Then we went to Waffle House for dinner. We loved the service there. Tracy (our server) made sure it was okay when the Wee One ordered a certain drink. I thought that was great. Afterwards we went back to the hotel for a little while. We were going to ride the Ferris wheel that was across the way from our hotel. However, we would have to wait for almost an hour and then pay $50. That was not going to work with the boys. They decided to go swimming but the water was too cold. So we went to bed. The boys had a pull out to sleep on. The trouble was it was a single so the Wee One slept curled up at the top while the Imaginative One slept curled up on the bottom. Click on the photograph of the dogs with sunglasses to see more pictures.